The radio-navigation products offer entertainment (radio/CD) and navigation functions with an optimal price-performance ratio, at the same time ensuring the quality and safety requested by integrated automotive systems. Radionav provides connectivity with consumer electronic devices in order to guarantee a completely safe use of mobile phones and multimedia music readers while driving: the system includes a Bluetooth® interface for the hands-free use of mobile phones and for digital audio streaming functions (A2DP), in addition to a USB port for listening to music in multimedia format, including MP3 and MP4 / AAC / M4A audio and for the management of iPodTM and iPhoneTM. A video camera can be connected to the system to ensure assistance during parking manoeuvres. Fast itinerary calculation is ensured by the SD card device, which can also store the entire map of a continent. The 2D/bird view representation on a 6.5” colour screen guarantees a look-and-feel comparable to the one offered by high-end systems available on the market. Thanks to the dual tuner radio, excellent reception of radio stations is obtained as well as the decoding of TMC digital traffic messages. The Radionav functions can be personalized by adding different components such as DVD, integrated digital radio and image display from SD card. 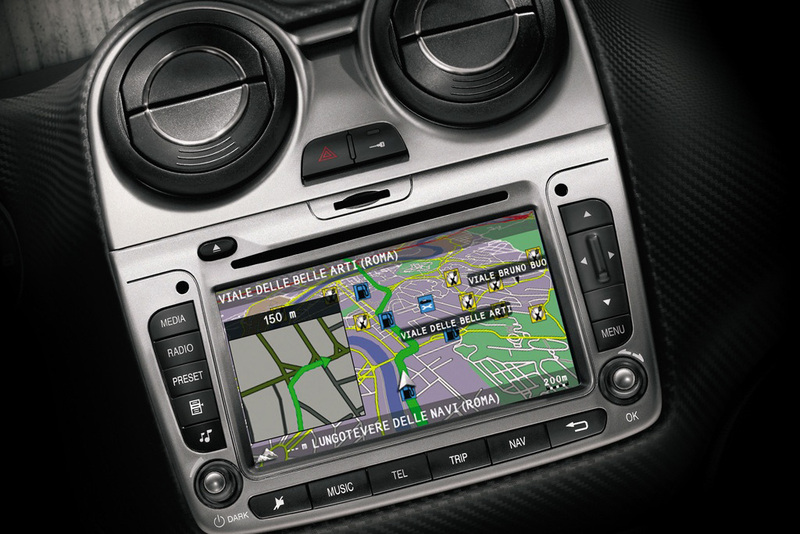 The connectivity and multimedia platform represents Magneti Marelli’s latest innovation in the Infotainment, Connectivity and Navigation integrated systems. The system is equipped with a 7” high-resolution touch-screen (800x480) featuring a sophisticated Human Machine Interface and a graphic processor with high power. Thanks to the connection to the CAN network, the device can provide the main vehicle information directly from the display, with complete access to diagnostics and to the trip computer. The e full multimedia entertainment interface features an AM/FM radio with triple tuner and a USB port for iPodTM / iPhoneTM, music playing in multimedia format and image display. The high-end version can also be fitted with a second USB port. The multimedia system is completed by a jack audio and an external CD player that can be connected to the system. The hands-free telephone and audio streaming (A2DP) functions are guaranteed by a Bluetooth® interface. Internet access is also available, and specific services on dedicated portals can also be used by means of a USB 3G key. The high-end version also offers onboard navigation with TTS (Text-to-Speech) and TMC (Traffic Message Channel) for traffic data management, completed by detailed map information and POI with the names of Filling Stations/Stores. The in-dash computer integrates entertainment, navigation, connectivity and productivity management functions, at the same time guaranteeing automotive standards in terms of quality and safety. A large colour TFT 800x480 screen ensures optimal display. The touch-screen facilitates interaction with all the functions, avoiding complex menus. The system includes a Bluetooth® interface for mobile phone connection and hands-free use and for the digital audio streaming (A2DP). The system can be connected to an external modem that guarantees fast Internet connection and access to services; the radio (including the satellite type), the CD player together with the USB port and the Bluetooth® audio streaming represent a complete range of multimedia and entertainment functions. Software components can be added thanks to the open platform based on the Microsoft AutoTM Operating System.